The boy Samuel was serving God under Eli’s direction. This was at a time when the revelation of God was rarely heard or seen. One night Eli was sound asleep (his eyesight was very bad—he could hardly see). It was well before dawn; the sanctuary lamp was still burning. Samuel was still in bed in the Temple of God, where the Chest of God rested. I take it from this that the people of Israel were in a time of relative spiritual darkness. The reference to Eli's bad eyesight is probably an extension of this. Why else would the narrator mention it unless he wants the reader to understand that God's priest is just as spiritually blind as everyone else? However, in spite of all this the narrator notes that "the sanctuary lamp was still burning", perhaps a sign that the light hasn't quite gone out on Israel's awareness of God. Just like that. Out of the blue. God calls to Samuel! What do we notice about Samuel's response? Firstly, there is no surprise. Samuel doesn't awaken and say to himself, "Whose voice is that? I don't recognise it!" The translation here makes it clear why: the voice he hears isn't strange, it is Eli's. Secondly, we can then note that when God calls to Samuel he does it in a familiar way. When God is revealed to someone this revelation may well resonate with something familiar. It is extremely rare for God's voice to boom down from heaven and sometimes it is incredibly difficult for us to listen to the still, small voice. It therefore makes sense that God may choose to speak to us through others and that seems to be what's happening here. Eli's response further emphasises his own spiritual blindness. Rather than recognising what has happened Eli is rather abrupt. There's probably a challenge here to the priesthood of all believers: How often do we recognise God speaking to someone through us? How often do we say, in essence, "I didn't call you", instead of perceiving that God has called? The same pattern recurs and this time the narrator makes explicit what was merely implied earlier: Samuel doesn't know God for himself. It's no great surprise that Samuel doesn't know what is going on, how could he? We don't often get to know someone new without an introduction! Eli's spiritual fog finally begins to lift. He finally realises what is happening! At this point Eli takes on a position of great power and authority and there is, therefore, also a great risk. Power and corruption often go hand-in-hand and this situation is no different. Eli takes on the function of the voice of God for Samuel; when God speaks Samuel hears Eli's voice and it quickly becomes possible now that when Eli speaks Samuel understands it to be God speaking. I'm sure that lots of us could identify fathers (or mothers) in Christ who have been incredibly influential in our early journey of faith. It seemed at the beginning that everything they said was like something coming from God. When in that position there's always a risk of the abuse of power. I'm afraid that church history has plentiful examples of those in positions of power turning their authority into an opportunity for self-aggrandizement. The person through whom God speaks can often end up mistaking themselves for God. So how does Eli respond when he recognises his own status in the eyes of Samuel? He does exactly the right thing by pointing beyond himself to the bigger reality that is calling Samuel. He shows Samuel the way forward and invites him to participate in the bigger reality of God. 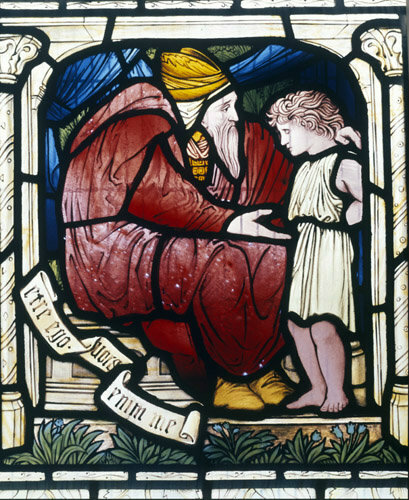 Note that now God's relationship with Samuel is much more direct: "God... stood before him". Even though he's been there all along Samuel is now in a position to see him. What do we take away from all of this? Firstly, the role of the priest is always to point forward to God. There's always a human temptation to make ourselves important and to lift ourselves up. Eli teaches us that we need to direct people to a bigger reality. Our thoughts, ideas and projects are never ends in themselves (however much we'd like to think they are). Secondly, we ought to learn to recognise when God is speaking through us (and be careful with it). Sometimes we can inadvertently find ourselves in positions of spiritual authority (this certainly applies to those in church leadership and youth work roles). Even someone we consider to be just a friend can be greatly influenced by the things we say. Therefore, we all need to regularly examine our own hearts. Do the things we do and say point beyond us to the resurrection life and union with Christ? Or do they subtly serve to further our own interests and re-enforce our own authority? Does the way we interact with others build the kingdom of God or our own personal kingdoms? I'll certainly confess to knowing how easy it is to dress up my own self-interest in pious words and the "right" language and how easy it is to be self-deceptive on this front. Thirdly, we ought to be aware (and appropriately non-idolatrous) of our own "god parents". When we find someone we really "connect" with it's easy to read everything they say as divinely inspired. I'm on a bit of a Richard Rohr binge at the moment. I love him. His daily meditations always seem to hit my nail right on the head. However, I'm aware that I need to check myself regularly. Is my appreciation of Fr. Richard leading me deeper into the likeness and love of Jesus or into the likeness and love of Richard Rohr. If it's not the former then he becomes an idol instead of a priest. I know people with similar warmth towards Rob Bell, Mark Driscoll, Brian McLaren, Scot McKnight, Pope Francis and many others. These are all good in and of themselves but idolatry is dangerous. Remember: we're all priests. It's not just people in a dog-collar who should be pointing towards Jesus and saying, "See! The Lamb of God!" What follows is a precis and discussion of the wonderful R W L Moberly's essay entitled "Did the Serpent Get it Right?" (Journal of Theological Studies 39, no. 1 (1988), pp. 1-27). I often find myself coming back to this exposition of Genesis 3 because it is incredibly important for how we understand the human condition and, therefore, the rest of the Bible. A close and careful reading of what happens in the Garden of Eden illuminates much about the "problem" that Christianity is attempting to solve and has significant theological implications. The key scene-setting moment comes in Genesis 2:16-17. God has just created Adam and his first commandment to Adam (in this version of the creation story) is a positive one: "You may freely eat of every tree of the garden!" (NRSV) but there is one minor restriction: "but of the tree of the knowledge of good and evil you shall not eat". God doesn't particularly justify this prohibition (creator knows best and we should trust him on this) but offers Adam a warning: "for in the day that you eat of it you shall die". It is the nature of this death that needs some discussion, but we'll come to that later. All that needs to be said for now is that the implication is that there will be some fairly immediate consequence ("in the day"). The beginning of Genesis 3 sees the entrance of the Serpent. Much could be said about the way the serpent twists God's words (the positive commandment with a single prohibition becomes purely prohibitive in the mouth of the serpent: ‘Did God say, “You shall not eat from any tree in the garden”?’) but this would be a diversion from the main purpose of this post. What is really of interest is Eve's correction of the serpent. She rightly notes that God says they can eat of any tree, except for one (and, for some reason, adds an extra prohibition about touching the tree). Eve clearly knows the rules God has set out. However, at this point, the serpent flatly contradicts God's warning about eating from this tree: But the serpent said to the woman, ‘You will not die; for God knows that when you eat of it your eyes will be opened, and you will be like God, knowing good and evil.’ From this point on the tension of the story is established. On one hand, God has declared emphatically that "in the day that you eat of it you shall die" while the serpent contends that "You will not die" and implies that God's prohibition is a form of protectionism (we don't want these human beings to have our knowledge). So who is right? The only way to find out is for someone to eat the fruit... Cue Eve. On face value, it appears that the serpent is the one telling the truth here. Not only do Adam and Eve not die on that day (indeed, Adam lives to the ripe old age of 930! [Gen 5:5]), but also the serpent's prediction about eyes being opened come true! What are we to make of this? Do we have a situation in which the very first things God says to human beings is just self-serving lies and deceit? Is it the case that the shrewd serpent is the voice of truth? Surely a religion based on a deceptive, possibly bullying God deserves little attention. Therefore, if we want to save this story and avoid the Judaeo-Christian tradition falling down before it's begun we need to understand this story a little more carefully. There are a number of ways to understand this command other than the wooden version we've already discussed. Some are more satisfactory than others. I've heard it suggested that Adam and Eve were intended to live forever. Therefore, when God says "in that day... you shall die" it is not that they will literally drop dead that day but that the moment they eat of the fruit mortality comes to them. Previously they had been immortal; now the possibility of death is upon them. They don't die that day, they become able to die. I can see the appeal of such an approach but I end up rejecting it for several reasons. Firstly, there is no suggestion prior to this moment that Adam and Eve were created with the intention that they might live forever. Secondly, at the end of Genesis 3 God is worried that Adam and Eve might "reach out his hand and take also from the tree of life, and eat, and live for ever". This surely implies that Adam and Eve may have had the possibility of living forever but now do not. The possibility of becoming immortal being taken away is rather different to the transition from immortality to inevitable death. 2. We need to reconsider what God means by "death"
In recent years the concept of "quality of life" has been used in an increasing range of contexts. I've heard the idea used to justify abortion (the child will have a poor quality of life and so abortion may be more loving), I've heard it used to justify euthanasia (her quality of life is so limited that she would prefer to die). I've also lost count of the number of times I told my parents to "get a life" when I was growing up. By this of course I didn't mean that they lacked life in a biological sense; my outburst was related to my perception of their quality of life. Christian Aid have a wonderful slogan: "We believe in life before death". All of these examples serve to suggest that in many senses "life" and "death" are not simply binary options (ie. a person is either alive or dead). In a very real sense the concept of "life" is on a spectrum and we can rightly use the term "death" to refer those things that lessen our life in some way. When someone says, "A little piece of me died when..." they do not mean that they suffered necrosis of part of their body, they refer to an event diminishing the fullness of their life. Firstly, "they knew that they were naked; and they sewed fig leaves together and made loincloths for themselves". There is an instant sense of a loss of innocence. Whereas they had previously been naked and had been comfortable with their nakedness, they now have a sense of shame. As such, there is an immediate death in Adam and Eve's relationship with their selves; they are not longer unified beings but are in conflict with themselves. Their life is diminished. Death has come upon them. Secondly, "They heard the sound of the Lord God walking in the garden at the time of the evening breeze, and the man and his wife hid themselves from the presence of the Lord God among the trees of the garden". What had previously been a close and intimate relationship has become fractured. Adam and Eve are now afraid of God, aware of their shame, and the relationship is now an uncomfortable one. Life is diminished. Death has come upon them. Thirdly, "He [God] said, ‘Who told you that you were naked? 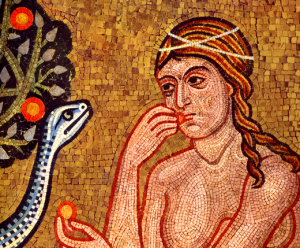 Have you eaten from the tree of which I commanded you not to eat?’ The man said, ‘The woman whom you gave to be with me, she gave me fruit from the tree, and I ate.’" What is Adam's response to God's (correct) accusation? He blames the woman. And so begins the process of shifting blame and responsibility away from ourselves and onto others. Adam and Eve were previously united but now use each other as objects of blame. Their relationship begins to break down. Life is diminished. Death has come upon them. until you return to the ground. The last outcome of their disobedience is that Adam and Eve have a broken relationship with the natural world. Whereas once there was a sense of harmony, now there is a sense of discord. Life is diminished. Death has come upto them. It is worth noting that the first three of these outcomes (and arguably the fourth also) are not "punishments" from God, but natural consequences of their actions. God does not make Adam and Eve at war with themselves, God and each other; this conflict is the natural outcome of what they have done. This story sets the tone for everything that follows. In many ways it outlines the "human condition" and, therefore, the way we interpret it has implications. If we understand the story as being about biological death entering the world through the sin of Adam then we can end up with a Christianity that is overly focused on "pie-in-the-sky-when-you-die". The problem for humans (in this understanding) is that we are all going to die and need to do something about it. However, it seems to me that Jesus is much more concerned with the richness of our lives in the here-and-now. Broken relationships that diminish our lives are in dire need of healing. Our fractured sense of self, in which we find ourselves in conflict with our own desires, needs binding back together. Our distant and fearful relationship with God needs to be made intimate once again. Our troubled relationship with our natural environment needs to be changed. The insight of Christianity is that we cannot rebuild these relationships purely in our own power. That is why God comes to us in the person of Jesus to enable our attitudes and egotism to change. This is no easy task and Jesus demonstrates just how far God will go in order to bring his children home into a right relationship with him. "Salvation" means "healing", not simply "going to heaven when you die". I, for one, need salvation for the healing of all of my fractured relationships. "Religion" means "to bind back together" (re-ligio - think "ligament"), not simply a set of rituals or beliefs. I, for one, need to be made whole again. When we make Genesis 3 about a binary choice between "life" and "death" we lose what Jesus says about coming to bring "life in all its fullness". Let's seek Christianity in a way that makes "religion" about wholeness and "salvation" about healing our broken lives, not just a set of doctrines to which we must subscribe in the hope of an eternal reward. Comments are very welcome. This post is brief and necessarily limited and incomplete to some degree. If there's anything I need to clarify/tighten up I'd appreciate the help!